ANZAC Day dawned cold and wet in Melbourne. The conditions didn’t stop 35,000 people attending the Dawn Service at the Shrine of Remembrance. I wasn’t one of them, though – instead, I got on board a Virgin jet and headed towards the north. Descending into Sydney, the city looked an absolute picture. It was one of those sparkling autumn days that I don’t think you really get anywhere else in the world. Only the whitecaps on the rolling seas hinted at the presence of some wind. I caught the train into the city. Emerging from the pedestrian tunnels out of St James station, I smelt rosemary and heard marching drums somewhere in the depths of the city. Yes, the March was well and truly underway. The Air Force veterans traditionally hit the circuit around 11am so I had a bit of time to spare. A marching band moved past, its mighty horns echoing off the skyscrapers. Walking out of the tunnels I spied a familiar figure. It was Tommy Knox, a Stirling flight engineer from 149 Squadron who I had met in Canberra last year. He was clutching a free cup of tea that he’d been given by Legacy volunteers at the train station. I’d received a letter from Tommy just a couple of days before. We had a quick chat before he hurried off to find the rest of the ‘Odd Bods’, the group he marches with. Returning to Elizabeth Street, I patrolled up and down the assembling throng, looking for people I knew. The first veteran I recognised was Hugh McLeod, a 49 Sqn rear gunner who, at “eighty seven and a half” says he is one of the youngest in the group. Hugh was adopted by the 463-467 Sqn Association some years ago and now joins them for the march and lunch each year. 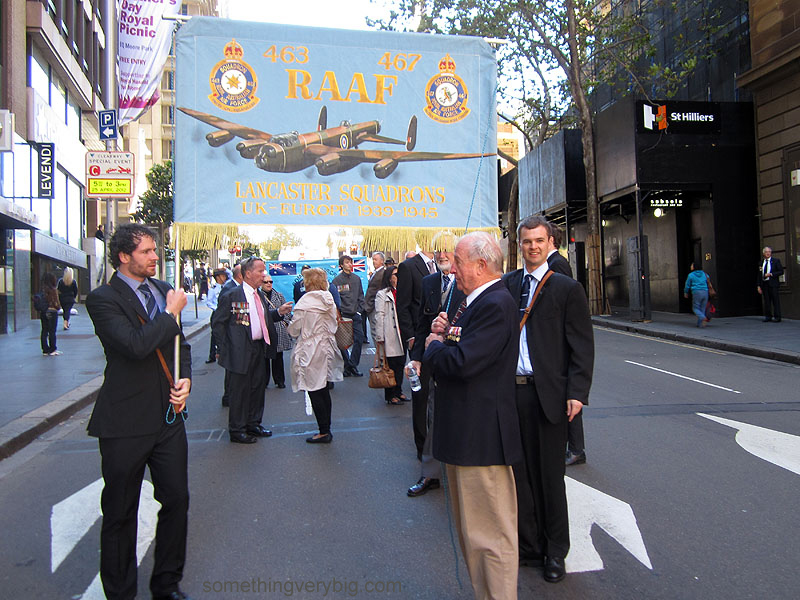 Once the banner arrived, safe in the care of Bryan Cook whose grandfather was a 463 Sqn mid upper gunner, it became the focal point and more familiar faces detached themselves from the growing crowd. In recent years it has become something of a tradition for Bryan and I to carry the banner for the Squadrons and we were again honoured to do so this year. Only six veterans actually marched this year. Even the indefatigable Don Southwell was absent, having pulled a hamstring recently. He rode in an RSL-provided Land Rover instead. The rest of the bunch was made up by numerous families and friends of veterans, numbering perhaps a couple of dozen in all. Left to right, they are Don Southwell, David Skinner, Bill Purdy, Alan Buxton, Hugh McLeod, George Douglass, Don Huxtable, Don Browning, Albert Wallace and Harry Brown. 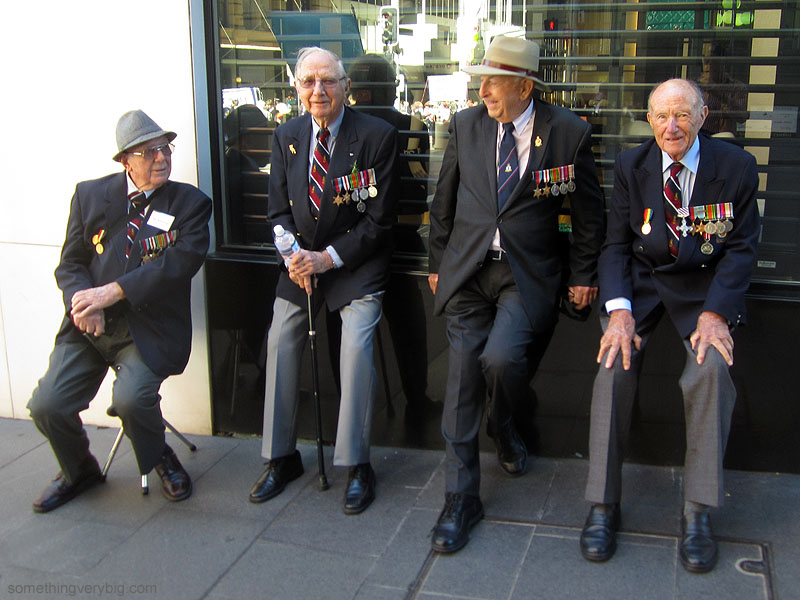 Five of these distinguished gentlemen will be travelling to London in late June for the dedication of the new Bomber Command Memorial in Hyde Park. And so another ANZAC Day passes. It is always wonderful to see these blokes each year, and long may it continue. President Don Browning made a toast to absent friends during the lunch – but added that, as long as there was someone to carry the banner, there would be someone to march with it, and so the spirit of the two Squadrons will live on. 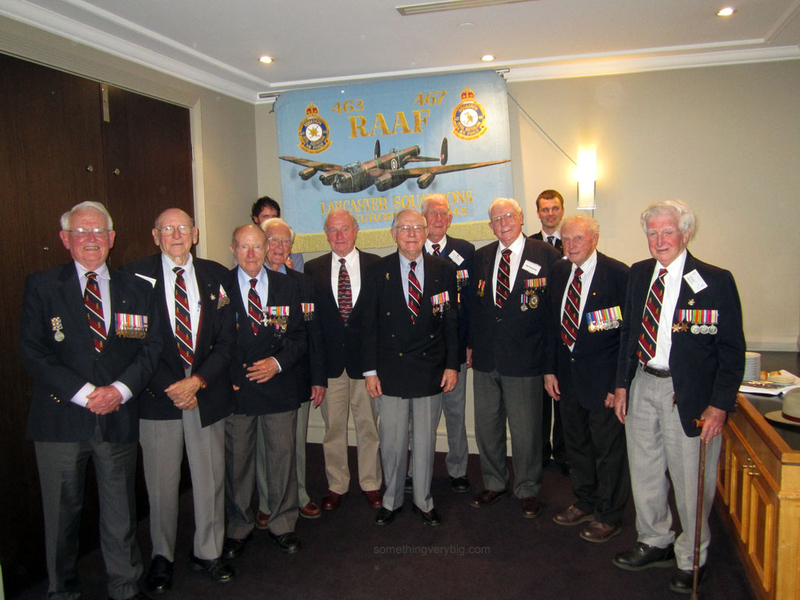 In reply to your article titled ANZAC Day 2012 there is a photo of 10 veterans from 463-467 Squadron. I noticed one of the veterans was Don Huxtable who flew one mission as 2nd Dickie with my Uncle F/S Robert Coward (Mid Upper Gunner) KIA over Holland on 23/10/1944. The Pilot was F/O John Dack (RAAF) who survived & was taken prisoner. There plane was “Piratical Pete”, Jo P 620. Only 3 survived the other two were W/O Jim McWilliam (RAAF) & Sgt H E Lee (RAF). I see that now – having recently read a self-published book by Brian Fallon, MUG in the Huxtable crew. Brian describes their arrival at Waddington – how they had just got all the arrival ‘chits’ signed when there was a call over the station Tannoy for Hux to report to the operations block – where he found out he was going second dickie to Rheydt with Dack’s crew. 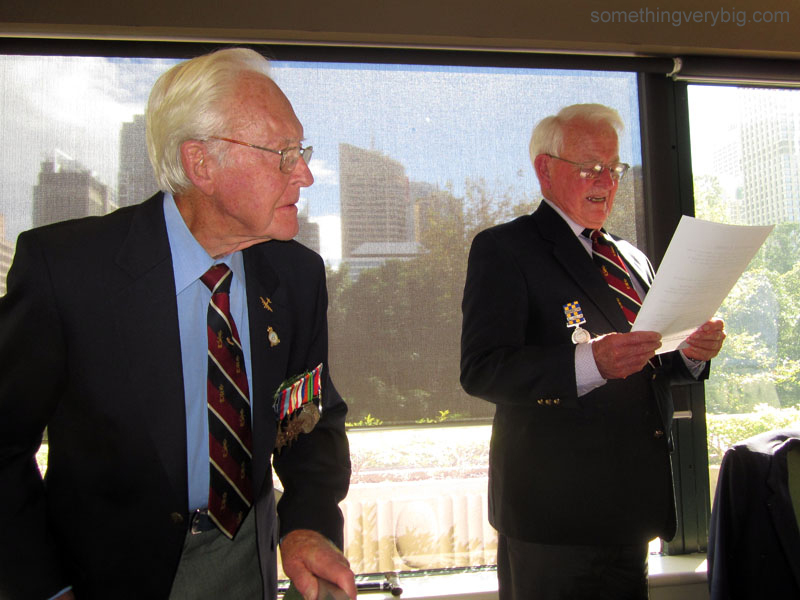 He’s been a little in the wars recently, has Hux, but he was one of the 30-odd veterans sent to the UK as part of the official Australian party at the dedication of the Bomber Command memorial in June last year, and I last caught up with him in November. He remains one of the true characters of the Waddington squadrons.